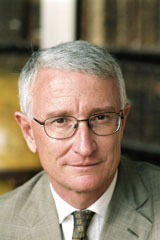 Sir John Hood is President and Chief Executive Officer of the Robertson Foundation and Chair of the Rhodes Trust. He also serves as a director on the boards of Blackstone, WPP plc and Aurora Energy Research; he is Chairman of BMT Group. In addition to these appointments, Sir John serves on the boards of the Fletcher Trust, the Mandela Rhodes Foundation, and the Said Business School Foundation. From 2004 to 2009, Sir John served as Vice-Chancellor of the University of Oxford. He served as Vice-Chancellor of the University of Auckland from 1999 to 2004. Sir John has been appointed a Knight Companion to the New Zealand Order of Merit. He was appointed a non-executive director of Study Group in January 2011 and was Chairman from 2011 - 2018.